The 16th NEEMO expedition will commence June 11. 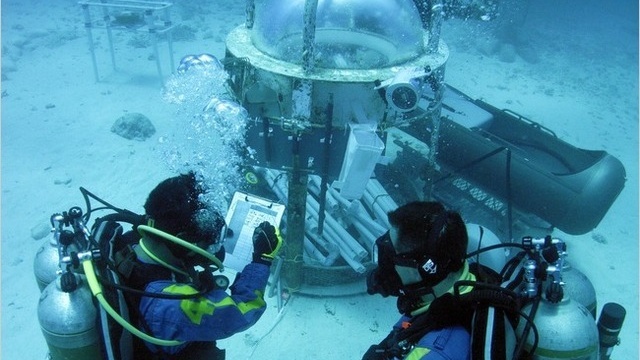 NEEMO, or NASA Extreme Environment Mission Operations, is an aquatic program that uses the under water base Aquarius to test technologies for use in space. “Water is a nice way to free your body and get to explore a different way of movement. Since we’re so stuck with walking here on Earth, it’s nice to float around, flip around — just like in space,” says mission commander Dottie Metcalf-Lindenburgher. Water provides a reasonable analog for the space environment since buoyancy mimics reduced gravity in some respects. NEEMO crewmembers are known as aquanauts, although some have or will achieve astronaut status as well. The 16th expedition is led by Dottie Metcalf-Lindenburgher, a Space Shuttle veteran. Timothy Peake, an up and coming ESA astronaut and Kimiya Yui a rising JAXA astronaut, will also join the crew, along with veteran aquanaut and Mars Rover principal investigator Steve Squyres. The two week mission will work on how to take a sample from an asteroid. “If you just do something as simple as hit a rock with a hammer, you’re going to go flying off into space, so we’ve got to develop a whole new set of tricks and tools for operating on the surface of an asteroid,” says Squyres. Past missions tested jetpacks, which did not work well for staying in one spot. The current crew will test miniature submarines. “Imagine this little submarine with a six-foot-long beam sticking off the front of it and an astronaut on the front of that like a hood ornament,” Squyres says. Asteroids could be a NASA target for a manned mission beyond 2025, but they may have to play catch-up as more players become interested in asteroids as celestial targets. JAXA already had a successful asteroid sample return mission with Hayabusa in 2010 and is working on a second one. Meanwhile, Planetary Resources, Inc. announced plans in 2012 to not only visit but also mine asteroids for commercial purposes.